Packer boys pick up two tough wins. Austin had to fight through some challenges to pick up two conference wins. Last Friday in Winona the boys won 77-64. Tyler Tupy sparked a big run in the second half on his way to a career high 12 points. Tyler filled a void left by Both Gach not playing most of the second half with an eye injury. Here is a link to the Daily Herald article on the game. 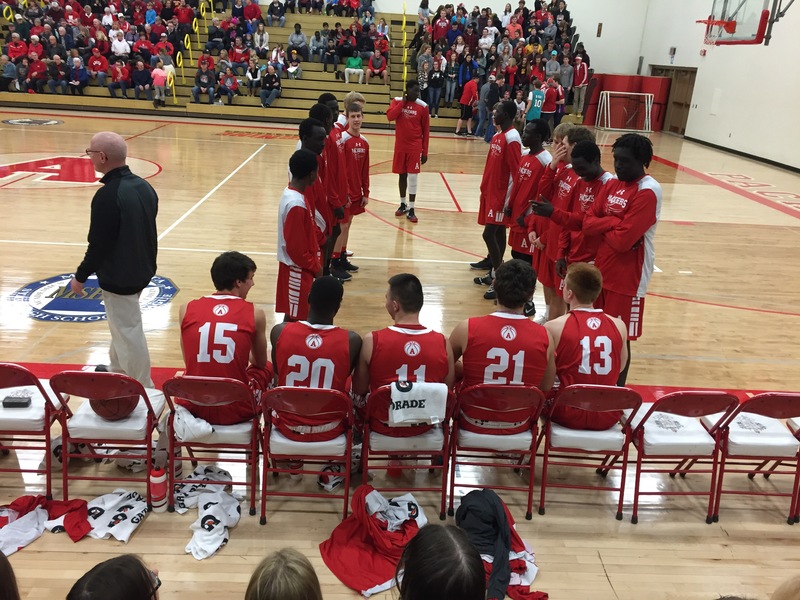 On Monday night the boys won a grind it out type of game vs. Mankato West 66-52. 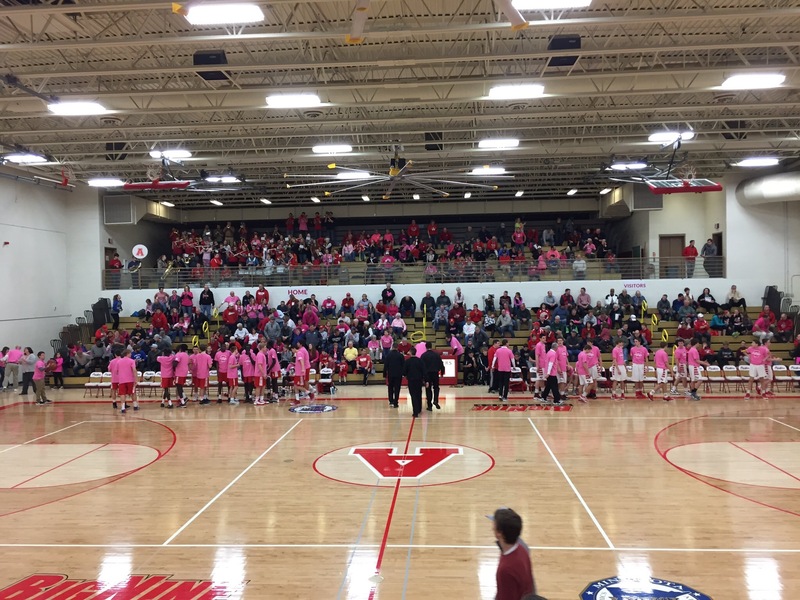 There was a great crowd on hand for Paint the Gym Pink night. Kyle Oberbroeckling had 10 points, five rebounds and two blocks for the Packers. The Packers are on the road for their next two games. Thursday night Austin travels to Owatonna. The Huskies are 11-3 overal and are right behind Austin in the conference standings. Friday night will be in Faribault. Here is a link to the Daily Herlad Article on the game. Packers pick up three home wins vs. Albert Lea, Mankato East and Faribault. Austin is now sitting at 12-1 after picking up three more wins. On Friday night Senior Pat Hagan had a career high 14 points leading Austin to a 71-24 win against Abert Lea. 12 different players scored for Austin. Austin started seniors Trent Brown, Jany Gash, Tyler Tupy, Pat Hagan and Jesse Synaground. On Monday the Packers beat Mankato East 72-68. Duoth Gach had 22 points and Both Gach had 17 points, 9 rebounds and 5 assists. 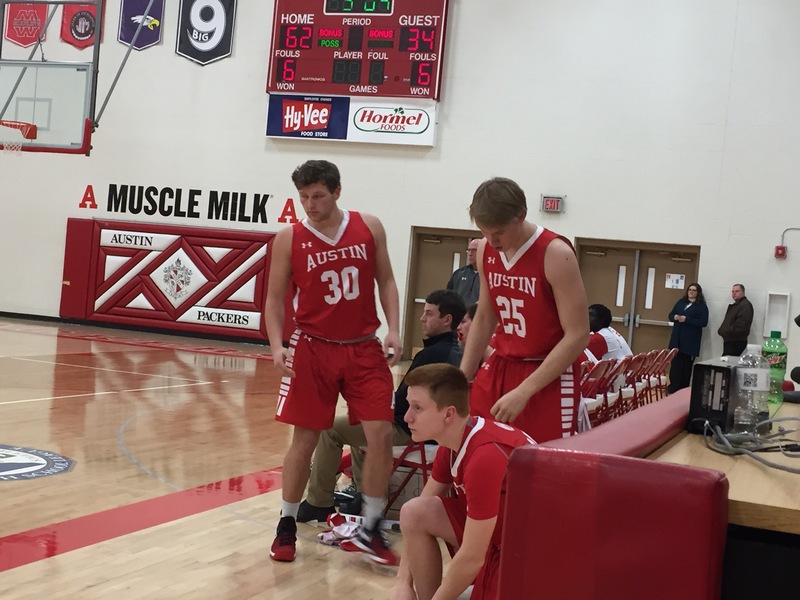 Austin came out hot and built an early lead but East fought back and kept it close behind the three point shooting of freshman Jax Madson. East was lead by Hayes who had 27 points. Tuesday was an important section game vs Faribault. The Falcons came into the game with a record of 8-2, with their losses coming to John Marshall and Owatonna. The Packers were in control the whole game in the 63-39 win. Six different players hit three pointers for the Packers. The team also played some of their best defense of the year. The 39 points was thr lowest of an opponent this year and the lowest Faribault has scored this year. Austin is back in action Friday in Winona. Packers lose first game of season to JM and Matthew Hurt. The Packers just couldn’t find an answer for Matthew Hurt. Hurt who is a sophomore scored a game high 39 points for the Rockets who beat Austin 75-64. Anytime the Packers made a run or a big play it seemed like Hurt answered with a play of his own. Austin was lead by Duoth Gach who had 25 points. Both Gach added 17 points and 5 assists. Here is a link to the Austin Daily Herald article on the game. Because of weather there have been some rescheduled games, and some other changes made to the schedule. January 23rd will be a home game vs. Mankato East. January 24th will be a home game vs. Faribault. February 2nd will be an away game against Owatonna. February 6th is an away game vs. Kasson Mantorville. February 17th will be an away game vs. Mankato East. Monday January 30th will be Paint the Gym Pink night. T-shirts for the event will be on sale this Friday(Jan 20th) and next Tuesday (Jan 24th). Shirts will hopefully be available online from the Games People Play website as well. Pack move to 9-0. JM showdown on Saturday. The Packers move to 9-0 with a home win against Rochester Mayo. Austin forced 20 turnovers and had more than a few highlight dunks. The boys are back in action Saturday at 7:30 in Rochester vs. John Marshall. This will be a big test for the boys and first place in the conference is up for grabs. Here is a link to the Austin Daily Herald article about the game. Packers stay undefeated with 3 more wins. The Packers beat Stewartville, Rochester Century, and Northfield to more to 8-0. Here are the links to the Austin Dailey Herald article for the three games: Caledonia, Century, Northfield. The Boys have a busy week coming up, with a Tuesday game at Mankato East, Thursday at Home vs. Rochester Mayo, and a big game against Rochester John Marshall on Saturday in Rochester. Packers beat top team in AA for big road win. Austin traveled to Caledonia and picked up n impressive road win 85-71. Duoth Gach continued his hot shooting by hitting 6 three pointers on his way to 24 points. Duoth also had 8 assists, 3 rebounds and 2 steals. Both Gach added 19 points, 7 rebounds and 3 assists. Tate Hebrink had one of his best games of the year with 13 points. Oman Oman came close to a double double with 10 points and 8 rebounds. Both teams played well and shot a high percentage. Caledonia was lead by Owen and Noah King who had 23 and 26 points. Austin outrebounded the Warriors 33-24 and won the turnover battle 8-10. Caledonia was ranked number one in class AA at the time of the game. The boys are back in action Friday at Stewertville. Pack fight off second half Rally to hold on in Red Wing. A historic shooting night from Duoth Gach propelled Austin to a a big second half lead. Duoth went 9-10 from three point range on his way to scoring 31 points. Duoth started the game with a huge alley oop dunk off and assist from his brother Both. Red wing had a second half rally when Austin had a stretch of cold shooting. The Wingers cut the deficit to 3 by hitting a three point shot after Austin missed the front end of a one and one at the free throw line. Here is a link to the Austin Daily Herald article about the game. The Packers are back in action on Thursday at home vs. Winona.